Ürümqi Diwopu International Airport (simplified Chinese: 乌鲁木齐地窝堡国际机场; traditional Chinese: 烏魯木齊地窩堡國際機場; pinyin: Wūlǔmùqí Dìwōpù Guójì Jīcháng) (IATA: URC, ICAO: ZWWW) is located in Diwopu, a suburb north-west of Ürümqi, the capital of the Xinjiang Uygur Autonomous Region in northwestern China. 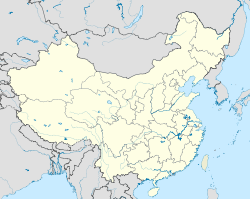 The airport is 16 km (10 mi) away from downtown Ürümqi. It is a focus city for China Southern Airlines and Hainan Airlines. It is the largest airport in western China and as of 2008, it is ranked the 21st busiest airport in China by passenger traffic. Summer 2005 saw Diwopu get a boost when the airport started receiving major foreign airlines; of them Korean Air was the first to start service from Seoul seasonally in June; two months later, Pakistan International Airlines began operations from Islamabad flying year round. Both airlines used wide body Airbus aircraft. PIA's operation did not last long and was suspended in April 2006.